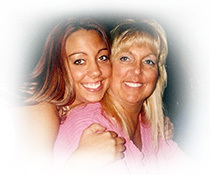 I'm Debbie Norris and my daughter is Heather Nicole Ancelet Norris. I'm sure you've heard about her if you've watched the news or read the papers. The word "murder" doesn't seem harsh enough to explain what happened to her. I find it hard to talk about Heather in the past. Heather was a wonderful young woman, and has touched so many lives as I hope she will touch yours. I have created this web site called Heather's Voice to educate teens about domestic violence because I know in my heart this is what Heather would want me to do. I want young people to understand that each and every one of you have the power to create your destiny. No one deserves to be mentally or physically abused. Do you have a question for Debbie or stories you would like to share? Feel free to send her a message. Q: Why should I be concerned or worried about using a "safe" computer? A: Everything you look at or do on a computer leaves "footprints" and there is no way to completely delete them. Abusive people will often want to track everything you do. Try to use a computer in a public library or an internet café. Q: Why should I have a safety plan? A: Abusers will take drastic measures when they think they are losing control over you. This is a dangerous time. Have a code word that you can use to let friends and family know you are in danger without alerting the abuser. Keep emergency numbers and crisis hotlines. Q: What do I do after I leave the relationship? A: Don't do the same things at the same time. Take different ways to school or work. Change your phone numbers and e-mail. Be with friends and family whenever possible. Q: My daughter might be in an abusive relationship. What can I do? A: Watch for these red flags: injuries that your daughter won't explain; her boyfriend constantly checks up on her; she gives up on things that were once important to her. Talk to her and most importantly, listen.